The other day someone got in touch via The Boy's Behaviour to share their thoughts. This is not unusual, many people comment and email me to share their views and experiences, but the person yesterday caught me unawares because it was the first time I'd heard from a birth parent who had experienced their children being removed. 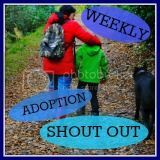 Mostly those who get in touch are other adopters, or people who are either interested in becoming an adopter, or are on the journey to becoming approved. Occasionally I hear from other parents who have children with similar behavioural problems to Mini, or parents of children with special needs. Every now and then someone with a background in psychology, parenting, or attachment comes along. And sometimes I hear from social workers who want to discuss or learn from our situation. So to hear from a birth parent - someone like Mini's mum, really shook me. Their experiences are completely different to mine, and this person clearly felt strongly about his or her situation. It kind of got me thinking about whether any of the parties involved in adoption really understands what the others go through. I know a little about how Mini's birth mum felt...she shared some of her feelings with us when we met with her, and since then she has made her feelings known publicly on internet forums for parents who have had children removed, and we were also made aware of her thoughts before we met her. I know she feels very strongly that social services treated her unfairly, and I know she thinks the reasons her children were taken away were wrong and unjustified. And I know that even when we met her (in the middle of introductions with Mini) she felt sad for us because she still believed he would be returned to her, and we'd be let down. I also think I'd know how I'd feel if I had either of my children taken away. But I don't know that Mini's birth mother understands the process we went through to become adopters, the matching process and the agonising waits, and the difficulties we're experiencing now because of her actions. Don't get me wrong, I'm not blaming her. I know she had her own issues and they impacted on how she was able to parent Mini and her other children, but her actions, and the process of moving to foster care, contact sessions, then moving to us has caused Mini harm and has affected his brain development. He has experienced a traumatic time, and she was part of that. I focus on Mini's birth mother specifically because he was in her care and she then fought for him. His birth father wasn't involved at all. It was important for me to know more about her and understand her situation. Without that I would have found it hard to present a balanced view of her to Mini, now and when he's older. But I do understand and I feel no blame or anger towards her; only towards social services who - in my opinon - did not protect Mini adequately. Does it matter that birth parents don't know what adopters go through? Would it help them understand the system if they did? Would their opinions, and that of society in general change if they knew more about a) what motivates adopters (and it's not always infertility) and b) the traumatised children that we are parenting? Is there more we could learn from birth parents? Would they be willing to share more with us? I'm pretty sure if Mini's birth mother and I could chat again, we'd learn lots about each other that would help each of us...what do you think? s birth mum, but we were also lucky that she seemed to recognise that her children needed something she was unable to provide. In a letter to us post the boys moving in with us she expressed her understanding that the boys would be better off with us. She also asked that we never let them forget that she loves them. As we have never encountered any antagonistic behaviour from her it is very easy for me to think of her in a good light, and to speak positively about her with the boys. I remind them she loves them and happily answer their questions. I reassure her in letters that they know about her and talk about her. I'm not sure it would have made any difference to her if she knew anymore about our journey, her journey was and continues to be tough enough. I think she is just intelligent enough to know the truth about her situation. I tend to think that those that choose to be the victim in their situation will mostly be unable to remove themselves from this stance no matter how much information they have.I agree with Mamiddau that for most birth parents who feel the system failed them, the information would be misunderstood and not achieve a possitive effect just increased resentment. I'm pretty sure Mini's birth mother probably wouldn't care how hard the process for us was, or how hard life is now. And I know at the time, her feelings were so raw that she didn't have the capacity or desire to understand us and our part of the process. But I just wonder if it might make her less uncomfortable now about her son being raised and loved by us, if she realised just how hard it was for us to become parents...if she knew how vetted we were, how much we put into becoming adopters, would she feel more reassured that we are going to look after and love him? Reassured that we will fight for him and his best interests and reassured that we will do our very best to raise a wonderful person? I don't know...I'd just like her to know that we're doing our best for him, and to explain how hard it was to get here and how hard things have become might just help me explain how much we're putting into Mini, and how much we'll continue to.